After BMW and Toyota, Isuzu has now announced a hike in the price of its products. Isuzu also claims that the rise in the price is a result of an increase in input costs. The Japanese carmaker will increase the price of its luxury range – D-Max V-Cross and the MU-X SUV by 3 – 4 per cent. 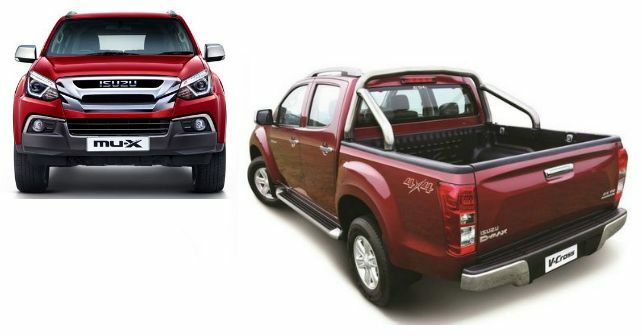 Meanwhile, the commercial range – the D-Max Regular Cab and the D-Max S-Cab will demand 1 – 2 per cent more. Expect the prices to be up by Rs 15,000 to Rs 1 lakh depending on the model and the variant. These revised prices will come into effect from January 2019. Last year too, the company had announced a similar price hike for all its models. Earlier this year, Isuzu brought in the updated D-Max V-Cross. With prices starting Rs 14.31 lakh, the D-Max V-Cross was equipped with a longer list of features including LED DRLs, LED tail lamps, side steps and a reversing camera. Inside, it also came with a 6-way electrically adjustable driver seat and a touchscreen infotainment system. In terms of safety too, the 2018 D-Max V-Cross was endowed with improved features including cruise control, electronic stability control, traction control and more. In October, Isuzu also brought in the refreshed MU-X SUV at a starting price of Rs 26.26 lakh. Updates to the MU-X include new projector headlamps with DRLs, redesigned front and rear bumpers and re-profiled tail lamps. Along the sides, the MU-X gets a new set of alloy wheels too. Other updates include, among other things, 6 airbags, hill hold and decent function. While the D-Max V-Cross manages to create a niche for itself, the MU-X competes against some tough competitors like the Toyota Fortuner, Ford Endeavour, Volkswagen Tiguan and the recently launched Mahindra Alturas.